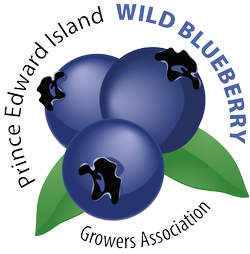 This article first appeared August 04, 1922 in the Charlottetown Guardian – The term “wild blueberry” was not in use at the time as cultivated blueberries has just been introduced a few years prior. The blueberries mentioned in this article are the low bush or wild blueberries. Again the blueberry season is here and this year the delicious harvest is reported to more than usually abundant over the wide area wherein beneficent nature has spread the feast. And the expanse is wide indeed in this western hemisphere, but by no means confined thereto. From Newfoundland to Vancouver from Virginia and Illinois to Labrador and Alaska grows this luscious summer fruit. It was not planted by the hand of man here or elsewhere on this continent. It is native to our soil. Before the days of English or French occupation, before Cabot or Champlain or Cartier made their discoveries in these northern waters, before even the first native canoe had landed on this island shore, the Blueberry was here, as one of the earliest settlers. Its contemporaries among living things plant and animals were the trees: the grass, the strawberry, the raspberry, the cranberry, the cherry, with the bear and the birds and other wild creatures that fed thereon. When the first settlers came they enjoyed the mid-summer feast as had the natives and the birds and beasts before them. When they made their first clearings on the richer forest lands the settlers’ fires burned over and seemingly destroyed the blueberry plants, which mainly grew on the poor, or so called “barren” lands. The pioneers regretted the lost, but only to find that in the following year there was a bumper crop of the same delicious fruit on the same ground. 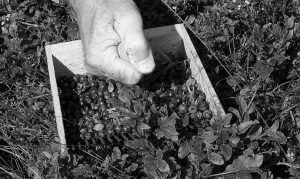 It is greatly due to the credit of the blueberry plants that it chooses its location where the land is poor and also that when its home is swept by fire, it invariably rises Phoenix-like from its ashes with greatly increased fruitfulness. Many a widely destructive incendiary fire has been set on the blueberry “barrens” with a view to a more luxuriant fruit harvest nest year. What other fruit producing plant can be thus reproduced by burning? Burn a spruce forest and a multitudinous growth, perchance of birch trees, slow growing and almost useless for fuel or mechanical purposes for a half century, will take its place. Herein lies one of Nature’s mysteries, unsolved as yet by almost any plant but the much enduring Blueberry. All the world loves a Blueberry. It tempts the appetite of all in one or other of the various forms in which it may be served at table. It is sweet enough to be served up in its natural form, with cream, or with possibly a little sugar. It is delicious in form of pie, or tart or pudding or as a conserve when cooked and canned for winter use. In the days of our fathers the secret was discovered of preserving Blueberries by simply drying them. On newspapers spread upon the garret floor pailsful, bushels on bushels were dried without cost, to keep indefinitely. Added moisture and heat restored the natural flavor and made a dish to tempt the palate at any season of the year. So bounteous is Nature that over half a continent she has spread this unique and health-giving plant and fruit to grow plentiful in the wasteplaces of the land. Health giving it is and always has been. Did not the early settlers, when doctors were few and liquor prohibition had not yet come about, cure the dropsies with Blueberry and gin? At least they believed they did so and the remedy had a wide popularity in those days. And no body has yet impeached the Blueberry as in any way an unhealthy luxury. Of all our native wild fruits, the Blueberry is the most plentiful, and admittedly as healthful as any other. This is important is these days when all schools of medicine agree with what the human experience in all ages of the world has established and confirmed as to the value of the fruit in our daily diets. Blueberries are good for the health of old and young; they are plentiful and they are “not hard to take.” Beasts and birds have varied their ordinary diet with advantage by feasting on Blueberries in the summer season. Among them were the bear and foxes. Who knows but that silver-clad beauties imprisoned in the ranches are even now pining for a feast of Blueberries as a needful and remedial change of diet? Try theme, “Mr. Rancher, and note the result.